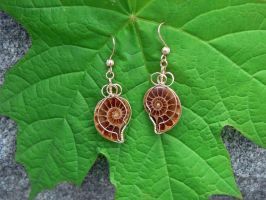 Split ammonite fossil earrings in 14K gold fill. Fossils are fascinating. Just think for a minute about the intricacy of ancient life that they preserve. They’re like little time capsules. It’s a little one! But I almost forgot, a warning about the time devouring dangers of pinterest. I saw a snake cuff bracelet that intrigued me and decided to try to make a ring version. And thus passed the day… So quick show-and-tell. Wire wrapped copper and emerald snake ring. About a size 8. I’d love to scale it down to make it a little less in the way, but haven’t had luck yet. Since I mentioned inclusions a few times last weekend and showed off a lot of rutilated quartz I thought I’d explain it a little bit here. In mineralogy* inclusions are materials trapped in minerals, normally during its formation. They’re often other minerals, but sometimes they are liquids or gases. Technically the insects and plants found in amber are inclusions too. 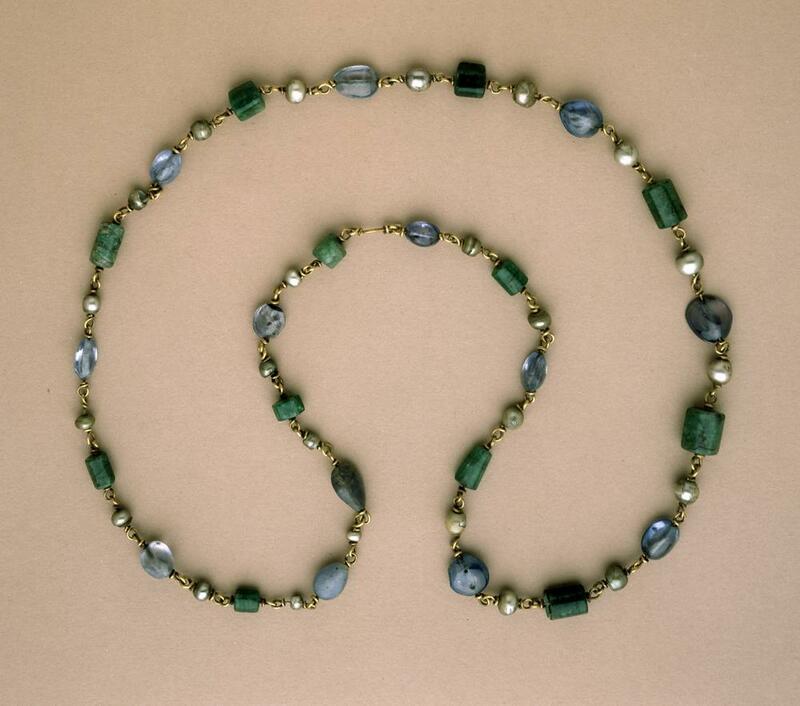 4th century gold Tunisian necklace in emerald, sapphire and pearl. Emerald is May’s traditional birthstone, but since good quality emerald is getting harder to find (I still say the most beautiful ones I ever saw were at the British museum in ancient jewelry) it seemed a good month to look at two other gorgeous green gems. Especially since outside the spring greens are starting to ripen! Chrome diopside really needs a trade name. Despite the fact that it sounds like a polishing agent, it is a beautiful green stone that is sometimes used as an emerald replacement. The word diopside comes from Greek, meaning double shape, after the shape of its crystals. Chromium is the element that gives chrome diopside its name and color. Traces of chromium are also what make emeralds green. Oddly enough, it’s also what makes rubies red! 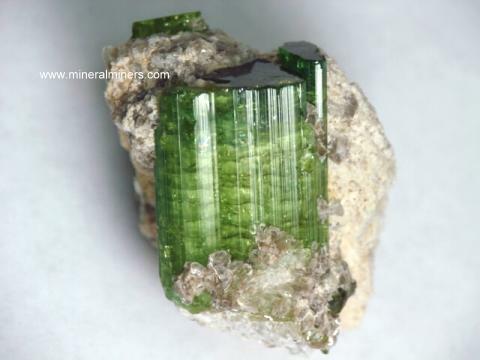 Chrome diopside can indicate proximity to diamond mines. So some people search for minute crystals as a hint of where to mine. Most chrome diopside come from Siberia, near the diamond mines there. It is also sometimes found near the diamond mines of South Africa. It is a much softer stone than emerald. 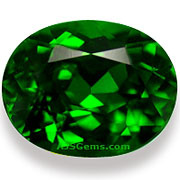 The hardness of stones is measured on the Mohs scale, and chrome diopside sits around 5.5-6.5. That means it is more easily scratched than emerald. It is best used in earrings and pendants; or in rings with a protective setting. Emeralds are tougher. They are rated at 7.5-8 in the Mohs scale; but it is one of the few gemstones expected to have inclusions. Inclusions break up the crystal structure and make both visible and structural flaws. 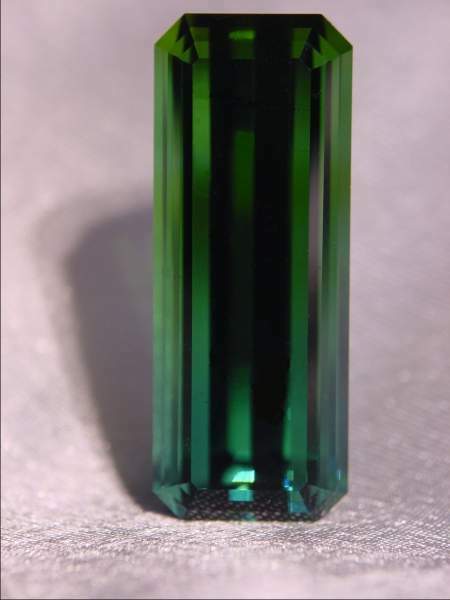 Green tourmaline showing some of the color variations to wonderful effect. Faceted by Robert Schock. Tourmaline sits between these two on the Mohs scale at 7-7.5. The name tourmaline covers a large group of related stone species that come in all different colors: clear, yellow, pink, red, brown, green, violet and black. Multicolored crystals are more common than single colored ones. Originally a lot of the different stones each had their own name; For instance verdelite was the name given to all shades of green and indicolite for all shades of blue tourmaline. Now they’re mostly just referred to as green tourmaline or blue, etc. The floral carving is an interesting twist on the watermelon slice tourmaline. 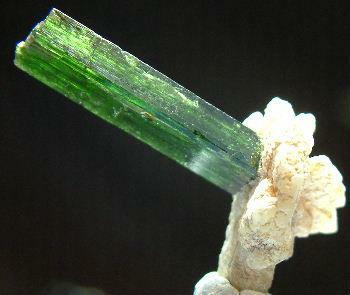 The intense pink and green are normally the most desired tourmaline variants. The pinks range into the most delicious raspberry colors while the best greens can almost put emeralds to shame. Tourmaline is found in many places all over the world. Brazil is the largest supplier, but mines are found on every continent except Antarctica. In the United States tourmaline is found in Maine and California, and is the former’s state stone. I mixed chrome diopside and green tourmaline for an emerald effect in this summer green tree of life pendant. Today is the sort of traditionally celebrated Shakespeare’s birthday. We don’t know the exact date. We know he was baptized on the 26th of April 1564, and that he died on the 23rd of April 1616. I’m not sure when it became a tradition to celebrate his birthday on the day of his death. 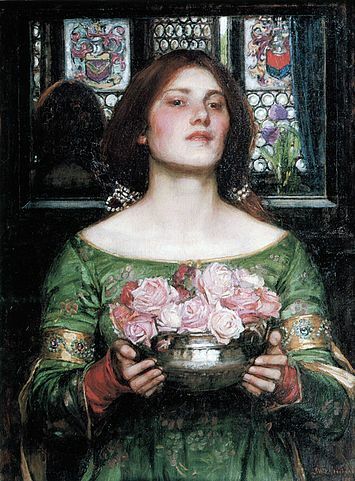 The first of two paintings by William Waterhouse inspired by Herrick’s poem. Robert Herrick (1591-1674) was an English poet and vicar. His major work, Hesperides, was published in 1648. His most famous line is from To the Virgins, to Make Much of Time: “Gather ye rosebuds while ye may,/ Old Time is still a-flying;/ And this same flower that smiles today/ Tomorrow will be dying.” I’m guessing that sounds familiar. I’m cheating a bit, since his cherry blossoms are white. Right now white on trees is a little too much like snow. The cherry I watch every year (a little nervously the past two-the recent winters have left it very bent and twisted) has pink blooms. Light with darker centers, as if they’d been white but stained with cherry juice! I’ve made pink pearl trees to try to get the feel of cherry blossoms, but I haven’t found any small enough to please me. I’m perpetually on the prowl for deep enough rose quartz, but this fall I stumbled on another option for cherry blossom pink stone chips. It’s called rhodochrosite. In its pure form rhodochrosite is nearly rose red. The name comes from the Greek for rose and coloring. Its more common forms are pink and light brown, sometimes grey. Rhodochrosite gets its color from manganese, and the more calcium replacing the manganese the paler it is. Rhodochrosite is fairly soft; it has a Mohs hardness of 3.5-4. That’s one reason it’s rarely faceted, and when it is it’s normally the purer red form for collectors. This does mean that it can be carved into wonderful figures and turned into decorative boxes. I think I first saw the stone with its banding on boxes rather than jewelry. The downside is that it isn’t a good gemstone for rings, and possibly not for bracelets, depending how tough you are on them. It seems to form near silver mines. First it was found in Romania, then later banded stalactites were found in an old Incan silver mine in Argentina. They’d been forming since the mines were abandoned in the 1300s. Argentina is still the principal source of banded rhodochrosite, which is why rhodochrosite is sometimes called rosinca or Inca Rose. The manganese content makes it difficult to refine silver ore so miners used to just dump the rhodochrosite. (*cringe*) Then collectors realized what was being lost! Now it’s Argentina’s national gemstone, and also the state mineral of Colorado.